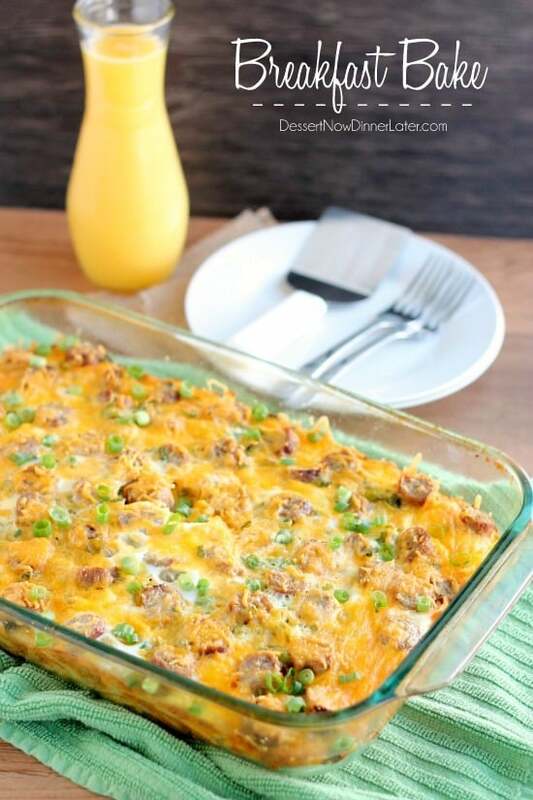 Breakfast Bake - Dessert Now, Dinner Later! Once or twice a month we like to have breakfast for dinner. We typically have pancakes, eggs and bacon. The kids love to drench their pancakes with syrup, I’m a great mom I know! I even got a waffle iron for Christmas and so now we alternate waffles with pancakes each time we have breakfast for dinner. 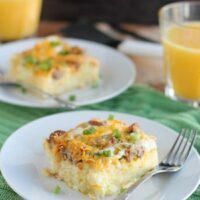 Although pancakes and waffles are a favorite of ours, my husband requested something with hashbrowns recently and so this Breakfast Bake was created. 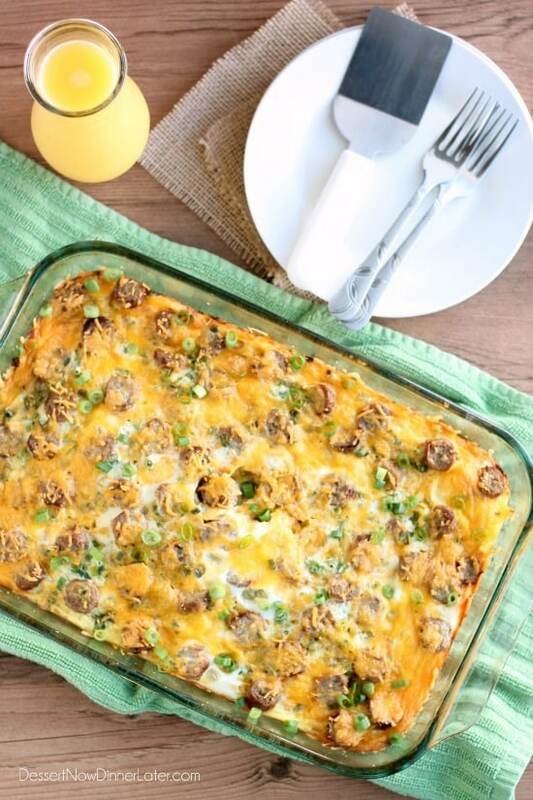 We like this meal a lot because it’s filling and it has all the breakfast components in one dish! 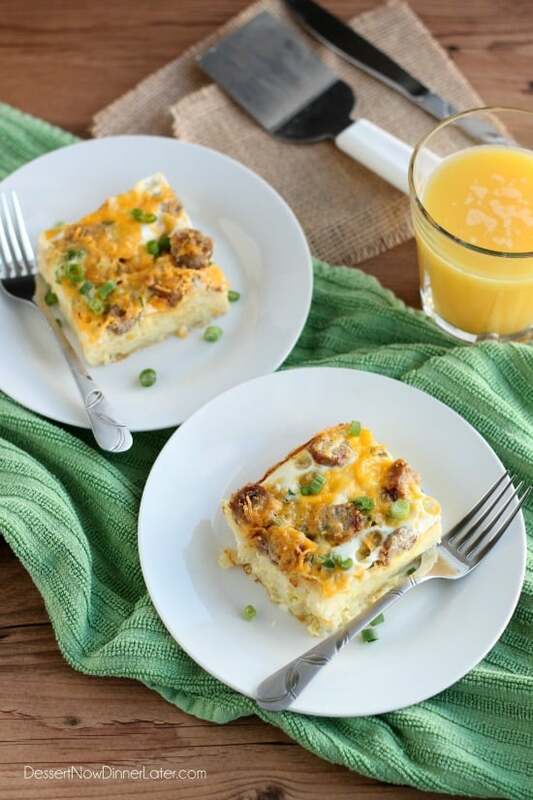 This Breakfast Bake was so simple to put together. If you use brown and serve sausage you will really only dirty one dish besides the one you are baking it in. We used turkey sausage, so I had to cook that first, but I try to be healthy where I can without adding too much extra work or compromising flavor. I am not saying this dish is healthy by any means, but swapping fatty sausage links with lean turkey sausage links is one swap in the right direction. I need to tell you all about my weight loss story, but I will save that for another day. If you ever have Breakfast for dinner you need to add this to the list for flavor and simplicity. It takes a long time to bake, so you can probably put it together in the morning and then throw it in the oven an hour before you need to eat OR you can even try cooking it in the crockpot. I don’t see why it wouldn’t work in there. 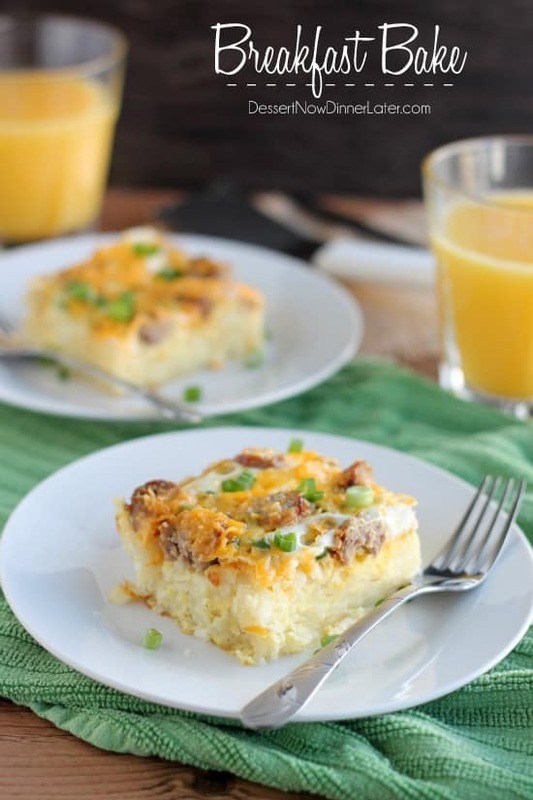 Make breakfast for dinner a new tradition in your house if you haven’t already! Enjoy! Cook sausages if needed, and cut into 1-inch pieces. Grease a 9x13-inch baking dish with pan spray. Spread frozen hashbrowns in the bottom of the dish. Season heavily with salt and pepper. 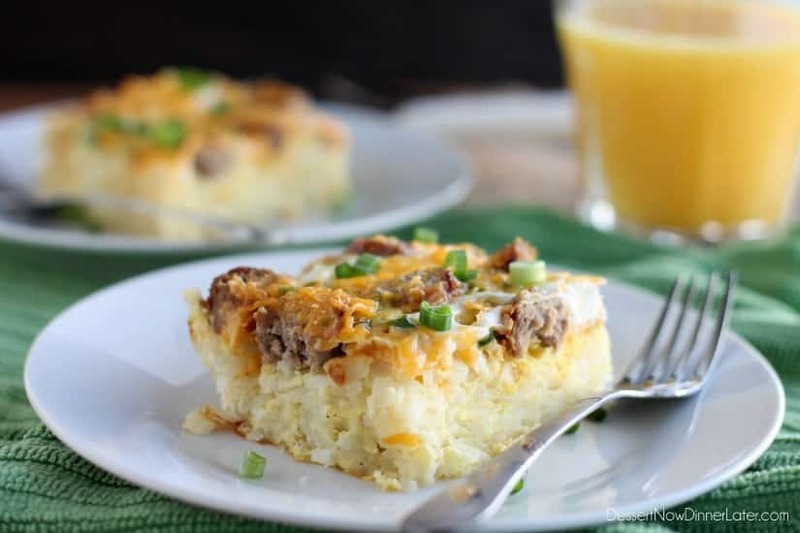 Top the hashbrowns with cut up sausage links and 1 cup of shredded cheddar cheese. Whisk eggs with milk, season with salt and pepper. Pour the egg mixture over the whole casserole. 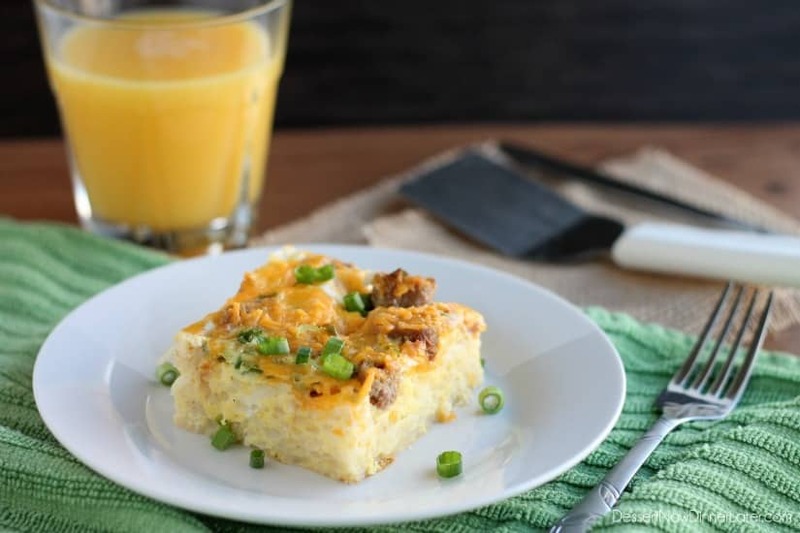 Sprinkle with most of the green onions and remaining ½ cup shredded cheddar cheese. Bake at 350 degrees Fahrenheit for 50-60 minutes or until eggs are baked through covering the casserole with foil the last 20 minutes. 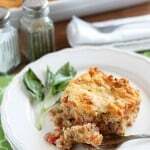 Test doneness in the center of the casserole when the pan is jiggled or a knife is inserted. Sprinkle with extra green onions. Enjoy with ketchup or salsa. This looks great for a cabin breakfast. I am going with a womans group this weekend. That sounds like a great idea! Enjoy! This looks so yummy. I bet my son will love it. Thanks for sharing the recipe. Ooo I love a good egg casserole! 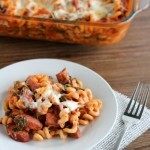 This looks really similar to the recipe we make on Christmas morning! Delicious! I love hashbrowns and anything breakfast for dinner. 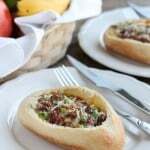 This would be cool to try in the slow cooker. I think it would be fabulous in the slow cooker! I need to use mine more for things like this! This looks great. I’m a huge fan of breakfast for dinner since I don’t often get breakfast foods. I honestly think breakfast for dinner is the only time I actually eat breakfast foods too. I am a smoothie and toast type girl for breakfast, so it’s nice to have a heartier meal like this for dinner. We love having breakfast for dinner! This needs to get added to the rotation! Just wondering if you know the calorie count/servings on this? If you click on the “magic” button underneath the main photo of this post, then click on the “Nutrition” tab, it will give you all the nutritional information. 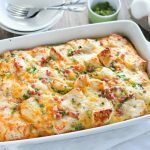 This casserole is typically cut into 12 servings. Mmm. I seriously love breakfast for dinner. This looks so delicious. I can’t wait to try it! I LOOOVE breakfast foods, this sounds wonderful! For sure! We have breakfast for dinner regularly at our house too. Enjoy!